Set on the hillside, this is the ground floor of a detached villa (First floor not used). Private pool, stunning mountain views. Sun terraces. Quiet location, but close to all facilities. 10 minutes from the town and beach. Supermarkets within walking distance. This is the perfect spot for a peaceful holiday but within easy reach of the fun of the town if you wish. The numerous coves and beaches are a few minutes drive and the mountains a twenty minute drive. Wifi and aircon are available at an extra small cost. Bathroom with modern, double, shower cubicle, toilet and basin. 3 golf courses nearby (handicap certificate required). This villa with gorgeous pool was in a fantastic location, and provided first class facilities for total relaxation. Everything we needed was on hand, and the beds were especially comfortable! Moraira is a lovely town that boasts many restaurants and a beautiful seafront yet remains not too "touristy". So if you are looking for peace and quiet with a touch of the real Spain within easy reach, this would be the perfect place. If you enjoy serious walking there are many mountain and hill walks in the surrounding areas, all well mapped out with degrees of difficulty, anticipated times and mileage. The town and beach are a few minutes by car. The nearby sandy beaches of Moraira and El Portet are perfect for children. Alicante airport and Valencia airport 1 hour by car. Murcia is about two hours. Car hire is essential. Beniconnect provide transport starting from €22 from the airports to Moraira where cars can be hired locally to avoid the initial drive from the airport. 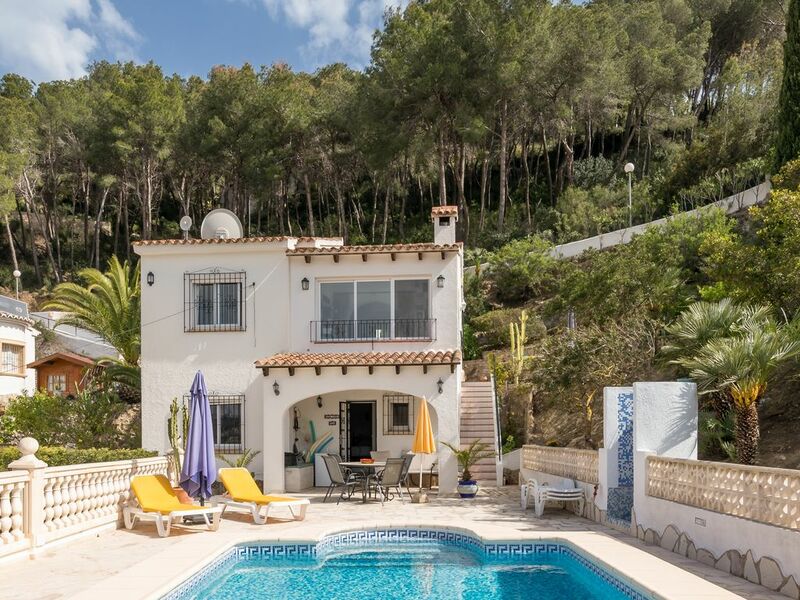 Moraira town is five minutes by car with ample free parking facilities. Lots of choices for beaches between five and fifteen minutes by car. You can be lost up in the mountains of Los Pinos in twenty minutes. Benidorm is thirty minutes with various theme parks. Denia, Calpe and Javea are within easy reach, about fifteen/twenty minutes. The area is not overun by tourists, as it is mainly privately owned villas. There is a wonderful marina and many inexpensive, good quality restaurants. The larger shops are in Calpe, Javea and Denia, all a short car ride away but Moraira is full of small interesting shops and has a weekly market. There is also an evening market during the summer. A new theatre has just opened offering all sorts of entertainment. Right next to the free car park in Moraira and you can not miss it.